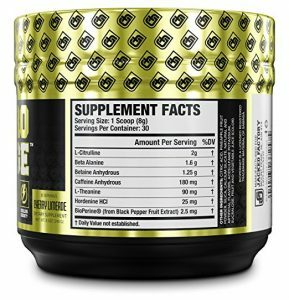 The Nitro Surge Pre Workout comes with a few ingredients and a mild formulation. For this reason it can be your daily driver as it manages to offer a balanced solution for most people. It is based on 2 grams of L-Citrulline. This is where is draws its energy from and given that it only has 2 grams, it will not come with the rush you might expect from some other edgy alternatives but with a steady energy. With 1.6 grams of Beta Alanine, it represents a solution which is easy to work with and which allows you to focus on the best overall results when it comes to energy. The creatine-free pre-workout is one of the leading solutions when it comes to improved energy levels with a manageable formulation. It does not come with 6 grams of Citrulline and caffeine as some of the solutions on the market. It actually uses only 2 grams of L-Citrulline which represents the foundation of the mild formulation. Even more, the product works great when it comes to manageable energy and this can also be seen in the caffeine content which is limited to 180mg. With a formulation which uses only BCAAs, it manages to deliver an impressive performance when it comes to better sustainability on the long-term. 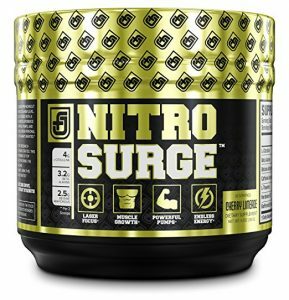 If you need to use a pre-workout with every training session, than the Nitro Surge is one of the options to consider as it will not force you too much as many other similar products. Made with Beta Alanien and coffee in small percentages, it represents a solution which can be consumed right before training and which can come with visible benefits up to an hour after drinking the formulation. For the best results, you should simply mix it with plain water and drink the pre-workout before you start to train. This allows you to properly manage its energy production and for many people, this also means that you should not consume it together with foods to slow down its absorption. The pre-workouts also comes with caffeine. Even if in a small percentage, you should still consider that if you do not tolerate the ingredient you should not consume the formulation. But for most people, the low caffeine content only represents a small part of a larger formulation. With included black pepper extracts, the manufacturer aims to improve acidity levels in the stomach which are responsible for better absorption rates. With one of the mild formulations on the market, the pre-workout offers one of the simple and efficient solutions when it comes to better energy and improved results with your workouts. At the same time, it represents a solution which is easy to work with and which allows you to see a steady form of energy which will not give you any heart issues as many of the alternative pre-workouts which are packed with caffeine. See it on our Top 5 Pre Workouts Without Creatine list.